Phase three of Ocean Edgesâ€™ poolside residences that will form the hotel complex will consist of 16 Blocks made up of studio, one bedroom and two bedroom apartments for a total of 148 units. The US$150 million project has already seen the construction of 30 – two-room hillside units and 16-one-bed hotel-style studio under phases I and II. Simon Octave, Sales Manager for Ocean’s Edge said the Poolside Residences form the center point of the new Oceanâ€™s Edge Resort, and will comprise studio, one and two bedroom apartments, all with superb views of the swimming pool and some top floor units with sea views. â€œBlocks 5 & 6 will start Phase three. Each of these Blocks will contain 10 studio apartments making a total of 20 units.Â The new Residences will form part of the hotel complex on the resort and prices start from US$370,000,â€ said Octave. Phase one was the Hillside units with 15 blocks, each containing 2 two bedroom apartments with a total of 30 units. At the recent launching ceremony, St. Kitts and Nevis Prime Minister Hon. 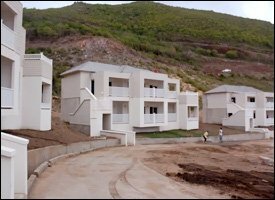 Dr. Denzil L. Douglas said the Cable Bay Hotel Development Company project is a continued demonstration of confidence in the future of St. Kitts and Nevis and its people.